There is enough reactive material in lead-acid batteries to keep them operating for at least 8-10 years. However, the average life of a battery, depending on usage, is only six to 48 months and only 30% of all batteries actually reach the 48-month point. This short life span is due to a series of problems caused by sulfation buildup on the battery plates. The image above shows a battery plate covered in heavy sulfation buildup. This sulfation acts as an insulation barrier around the battery plates restricting the energy exchange. Extended shelf storage prior to installation. Sulfation buildup begins almost the moment battery acid is added to a battery, so as new batteries sit in storage or on a store shelf, they will quickly become sulfated. This means a battery could literally fail soon after it is installed in a vehicle, even though it is "new." Extended period of inactivity of a vehicle. Corrosion of the battery terminal which increases resistance in the charge cycle, thus developing an undercharge situation. Maintaining a state of discharge. Temperature. 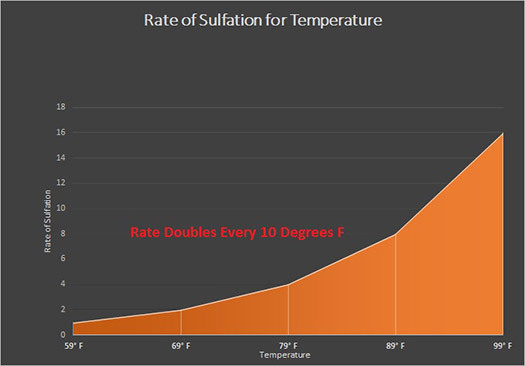 For example, when the ambient temperature rises, the rate of sulfation can double for every 10° increase in temperature. That means that if the outside temperature goes from 75° to 95°, sulfation can occur 400% faster than normal. Cold conditions can cause the vehicle's fluids to thicken. This means it will take even more power to start the vehicle, so the battery has to discharge even further and the result is a faster buildup of sulfates on the lead plates. Also, keep in mind that the battery's electrolyte can actually freeze if the battery is in an advanced state of discharge, and this could damage the lead plates. At 1.270 specific gravity (100% charged), it will freeze at -83° F; at 1.200 it will freeze at -17° F; and at 1.140 (completely discharged), it will freeze at only 8° F.
An undercharging situation where the battery is maintained at less than maximum voltages, such as on frequently-used vehicles that stop and go constantly. Since the vehicle is moving at slower speeds or idling, the alternator is not charging at an optimum rate. The result is a battery that is not fully charged even though the vehicle is running all day. And since it isn't fully charged, it will begin to sulfate. A vicious cycle is then created because the more the battery sulfates, the less energy it will accept and the battery will be undercharged even more. Ultimately, it too will die. 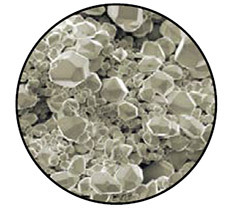 The most effective cure to the sulfation problem is PulseTech's patented Pulse Technology.